My wrists are behaving again: every day it seems that I can knit a little longer. Since I got the queue organized and a lot of projects lined up I have been on fire. 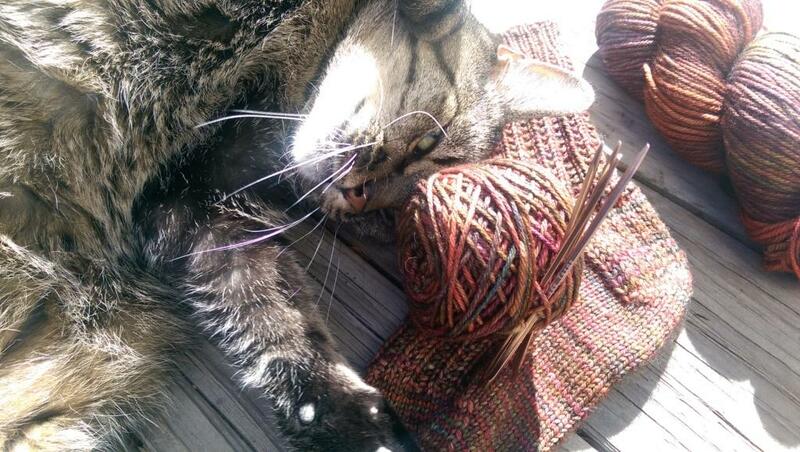 Since it is Wednesday I thought that I would just show off all of the knitting WIPs. 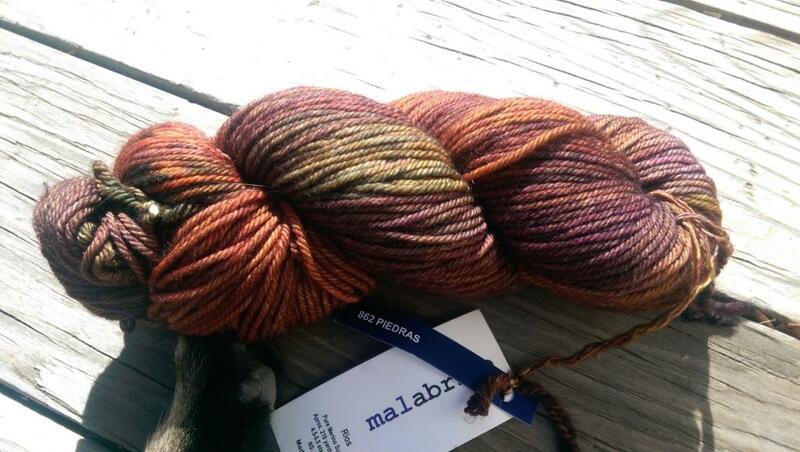 Isn’t this the perfect color for September? 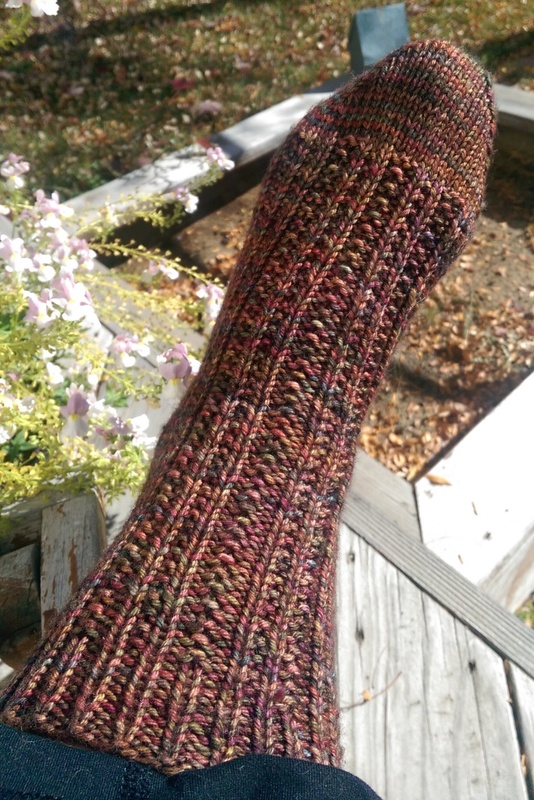 This is 100% superwash merino and the color is so rich and wonderful… I decided to make the Stepping Stones socks from the Book of Socks by Clara Parkes. The pattern is also free on Ravlery. My copy of the pattern says to use size 2 needles (with worsted yarn? Not with these wrists! I decided to use size 4 needles and the sock came out springy, wonderful, and has a good fit on my foot. To get the shot I had to put the sock onto my foot. Ta-daa! Here it is. The pattern was designed to change on the instep but I kept the same stitch pattern down the whole sock because I kind of liked it. 🙂 It’s nice how the colors in the yarn are broken up in the sock: no pooling allowed!! 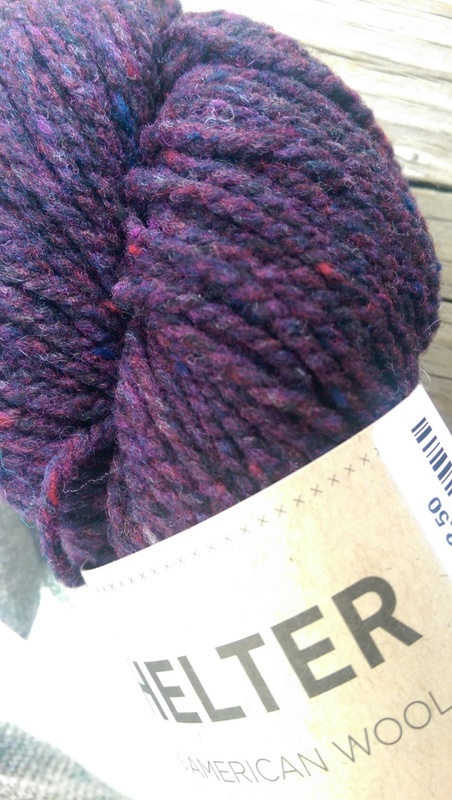 I bought this Brooklyn Tweed Shelter in August while doing Yarn Along the Rockies. It is soft, cushy, and fabulous. 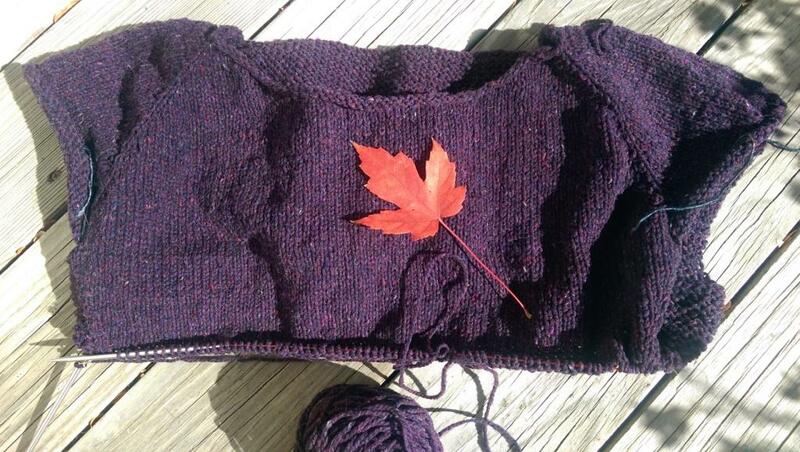 Here it is as a growing Daelyn Sweater by Isabell Kraemer. It is knitted from the top down with NO SEAMS!! The back is garter stitch which is kind of fun, and there is short row shaping at the bottom of the back so the sweater will have a slight tail. I want this baby done before serious snow arrives. 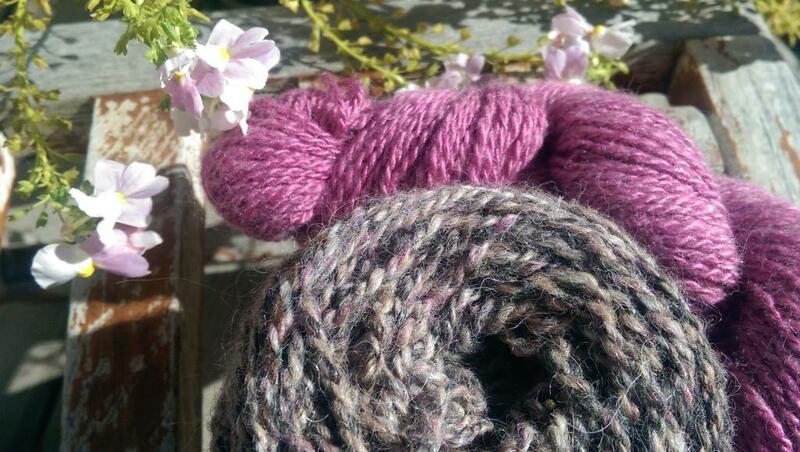 Handspun alpaca yarns. Don’t they just look like they want to be striped mitts? Tonight is the first frost warning of the year so I brought as many of my potted flowers into the garage as I could. I know that they are running out of time, but I hate to let them die. I think that next week I will hang indoor grow lights and get some of them indoors. The first snow can’t be that far off now. 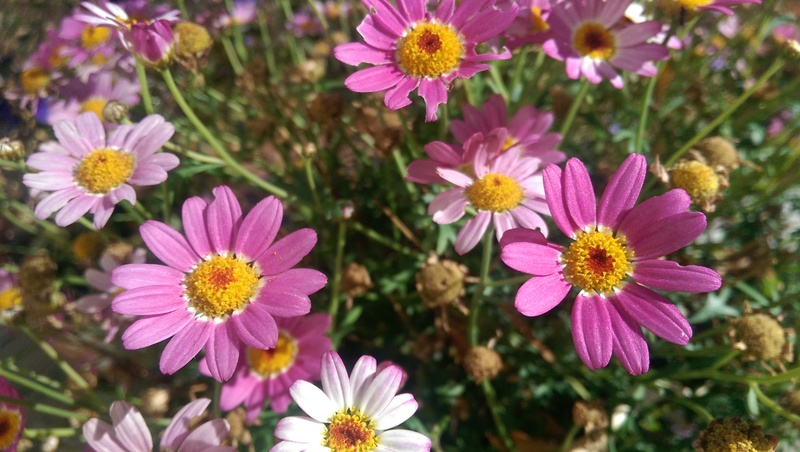 The last leaves are falling off of my trees and it is definitely getting colder, but this potted plant is still blooming its heart out. I moved this one into the garage for sure and may try to save it for indoor color this winter. Maybe it will be easier to capture the seeds once it’s inside. Another project! !